Cybercrime. Watch It Happen In Real Time. If you watch TV news reports about cybercrime, you may occasionally catch a glimpse of a high-tech control room where boffins sit watching fancy displays that show the current real-time state of global security. If so, and you like what you see, then here's a treat for you. Courtesy of security company Kaspersky, you can now have your own cyber control room, from the comfort of your own PC. You won't be able to control anything, of course, but you can see precisely what's happening all across the world. The Cybermap is a real-time display of all the malware, cyberthreats and other hacking attempts that are currently being detected by Kaspersky's security products that are installed on millions of computers. The map shows, in graphical detail, where these threats are coming from, what type of threats are involved, the intended target country, and the level of threat at any one time. You can pan and zoom the world map to focus on specific areas. It's both fascinating and educational to watch. And there are also links to various free Kaspersky sites that allow you to check your own security. There's no need to download or install any software to view the Cybermap. 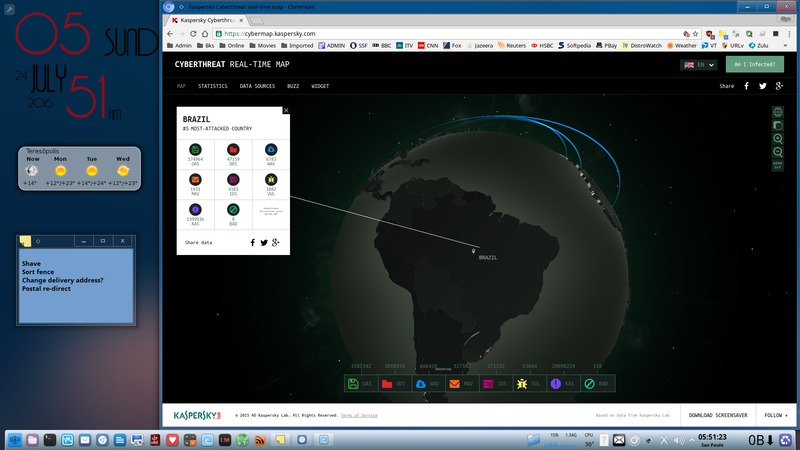 Just point your web browser at https://cybermap.kaspersky.com/ and watch in amazement. I find this dynamic map fascinating. It makes me wonder if similar displays in the "control rooms" of other antivirus vendors show similar patterns? Thanks MC.... I'll have another go at it. all good now MidniteCowboy.....I just opened the link in IE which is a browser that I never use, and it's working fine. Now I gotta figure out why it don't work in my default browser, SRWare Iron ? All I get is a black screen with nothing happening.